KPBSD students demonstrate incredible compassion and support for their homeless peers and the KPBSD Students in Transition (SIT) Program. They are on the move, making a tangible difference. Leadership students organized a collection drive for socks, hats, and gloves to benefit the local homeless population. Students created a PowerPoint presentation to inform their peers about the issue, designed promotional posters, and placed decorated collection boxes in each Advisory class. KMS students brought in donations for this “Socktober” event – collecting over 1,700 items. 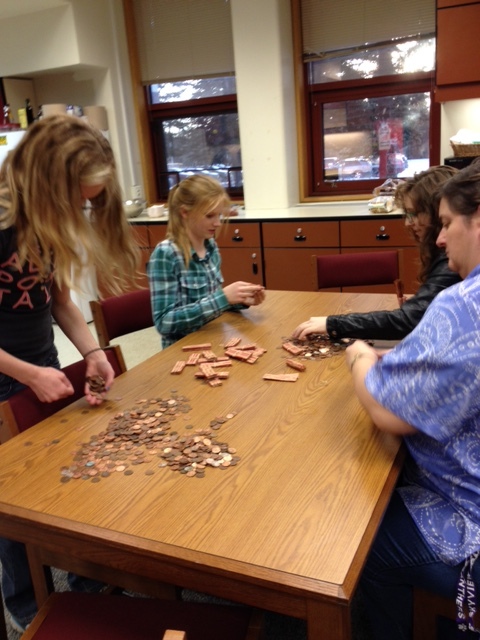 Panther Student Council sponsored a Penny War to benefit the SIT Program. Two collection jars were placed in the school office, one for seventh grade and one for eight grade. Pennies were collected and added up for each grades’ score. Other coins and dollar bills subtracted from the score for that grade level; sabotaging the other grade by adding silver or bills was encouraged! Wanting to make a difference for a family in need, Kenai Alternative Community Projects leader Maddy McElrea reached out to the community through Facebook. Within two days she had collected a variety of items including clothing, books, food, and household goods. “It really warmed my heart seeing that there were so many people willing to help within hours of me making a post. If I was able to do that, just think about what we could accomplish for all the other kids by coming together as a community,” said McElrea. For the second time in recent years, these two KCHS boys decided to celebrate their birthdays by thinking beyond themselves. 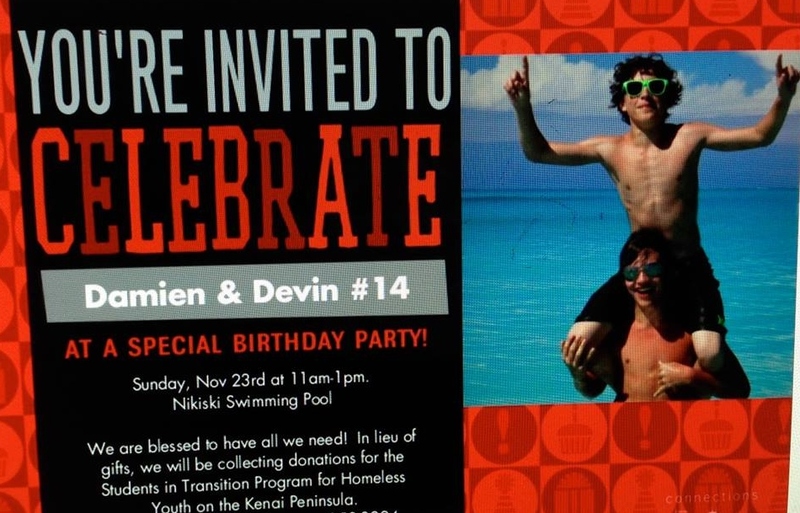 Invitations were sent to friends and family asking that in lieu of gifts, donations be made to benefit the SIT Program and local homeless youth. This resulted in a monetary donation as well as numerous food cards for local vendors to be used in emergency situations. 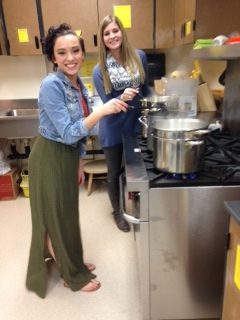 Spaghetti feed and auction raises thousands! 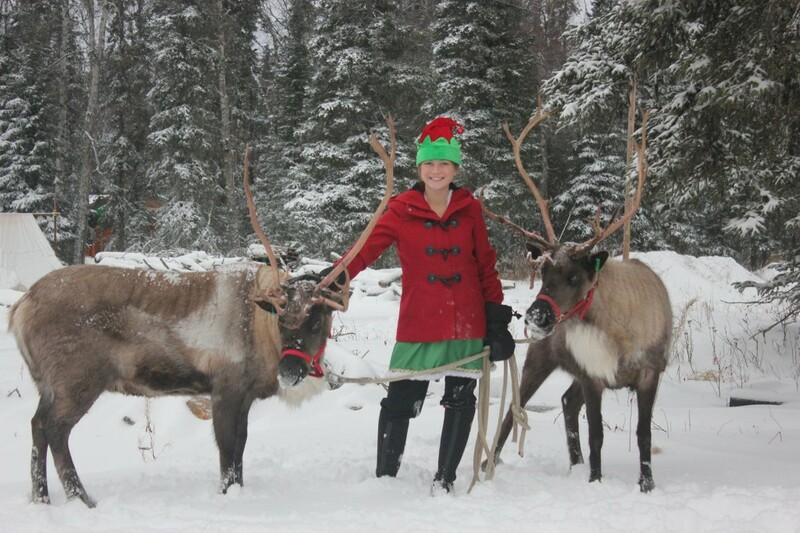 This Nikiski Middle-High School student and her reindeer, Crash and Comet, have made several public appearances throughout the Central Peninsula, as a fundraiser for the SIT Program and to help spread awareness. In addition to these photo opportunities with the public, Jenna does additional fundraising for homeless youth issues through her “Scene of the Crash” Facebook page and GoFundMe account. Hats and gloves adorn the tree! McNeil Canyon again sponsored their annual “Helpful Holiday Tree.” Food for the Homer Food Pantry was collected beneath the tree, which was decorated with hats and gloves donated for local homeless children. 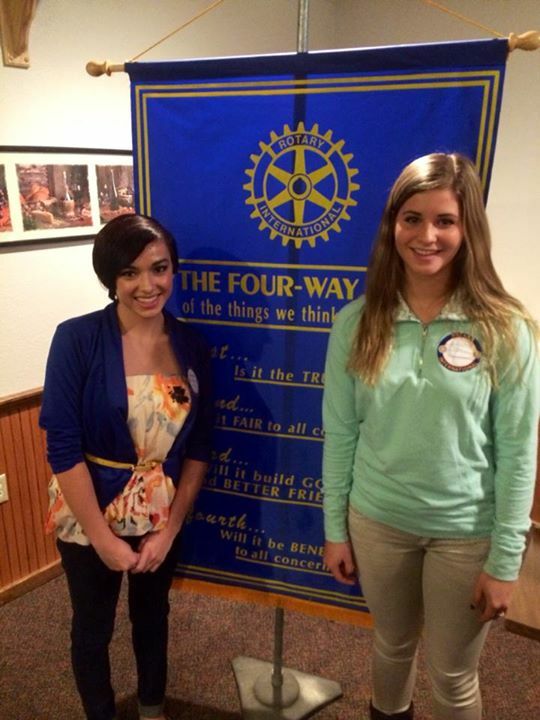 Chelsea is completing her senior project, collecting goods for backpacks she plans to put together for homeless teens. These backpacks will include items such as toiletries, job applications, business cards for community resources, and an invitation for a clothing giveaway at the Rec Room. This entry was posted on February 28, 2015 at 2:30 pm. You can follow any responses to this entry through the RSS 2.0 feed. You can skip to the end and leave a response. Pinging is currently not allowed.